'Turkistan' means 'Land of Turks' in Persian language. It was Kara-Khanid Khanate that contributed greatly to Turkify and Islamicise the region. After the Uyghur Khanate that prospered in Great Mongolia, some of the refugees moved to Karluk. Karluk was established as the Predecessor of Kara-Khanid Khanate. It dominated west half of Tarim Basin and became the main body to Turkify and Islamicise the Central Asia. Though Buddhism, Manichaeism, Nestoianism, Zoroastrianism and other religions were practiced in East Turkistan that time, Kara-Khanid Khanate set the complete Islamicism. Acceptance of Islam was made by Satuq Bughra Khan, the third Khan and the grandson of the first Khan of Kara-Khanid Khanate. 'Kutadgu Bilig (The Wisdom which brings Happiness)' by Yusuf Khas Khajib and 'Diwan Lughat al-Turk (Collection of Turkic Words) by Mahmud al-Kashgari are considered to be the pioneers of the culture of Turkic Islam and the greatest works by Turks. He was born into a honourable family in Balasagun and later moved to Kashgar, the centre of civilisations. He was highly educated in his early life and gained well-rounded knowledge. He presented his long verse 'Kutadgu Bilig', on which he devoted his time from 1069 to 1070, to Tabghach Bughra khan, the governor at that time and received the title 'Khas Khajib (Privy Chamberlain)'. The long verse is a moral book that shows how the sovereign rulers are to be. The main characters are the personifications of the virtues of Justice, Fortune, Wisdom and Man's Last End. In the book, politics, economics, military affairs and other social matters are discussed by monologues of the characters or debates among them. It has high artistic value and it is a very important reference for the Turk linguistical history and research of Kara-Khanid Khanate. Yusuf Khas Khajib died in 1085 and he was buried in the outskirt of Kashgar. The body was later moved to the current grave to avoid the damages from the river flood. 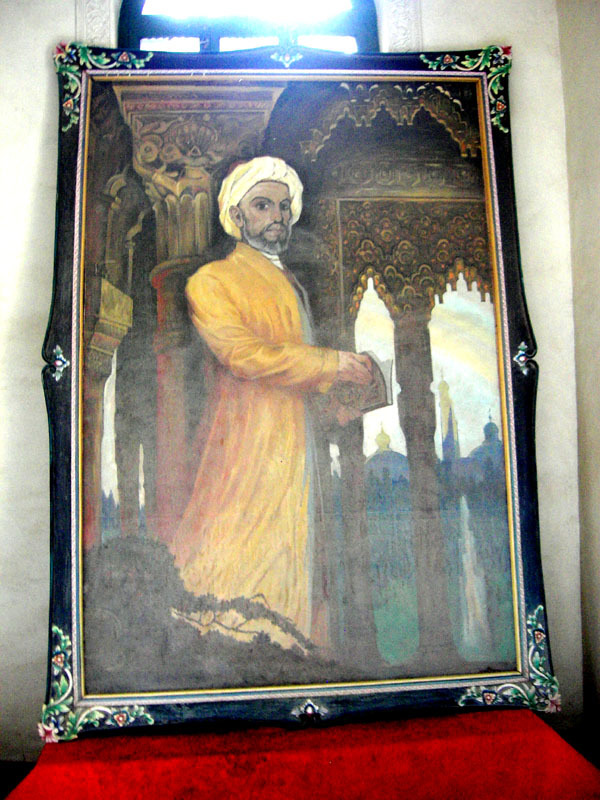 He was born in environs of Kashgar and after wandering the regions in Central Asia, he settled down in Baghdad, the capital of Seljuq Dynasty and wrote 'Diwan Lughat al-Turk (Collection of Turkic words)' which he dedicated to the Caliph of Baghdad, Al-Muqtadi. He was knowledgeable in Arabic language and he applied it to classfields of Turkic language to complete the book. The dictionary is consisted of 8 volumes and the articles count more than 7,500. Each article has a description in Arabic and folk ballads, aphorisms and related are added. It is considered to be an essential reference for research on Turkic studies as it also contains issues on history, literature, race, folk custom, society and so on. 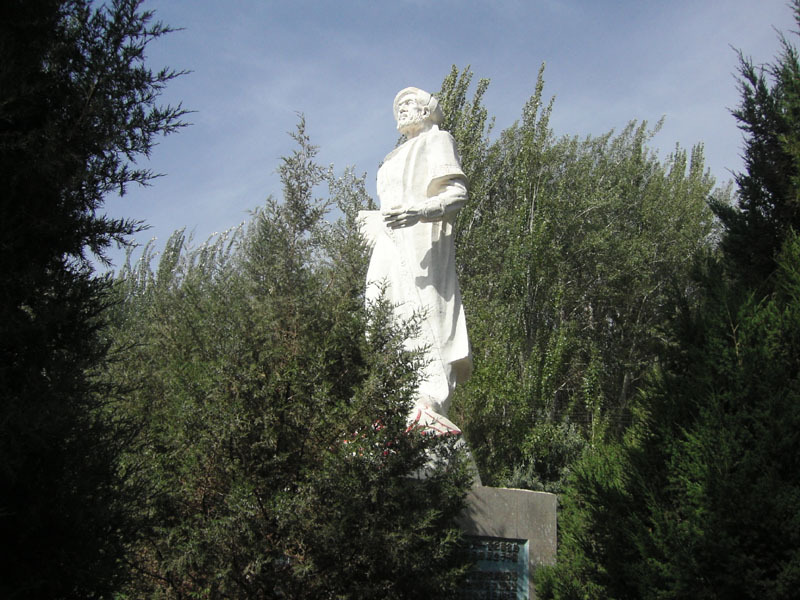 Mahumd al-Kashgari went back to Kashgar in his late years and he was buried in his home town Opal (4.5 kilometres west of Kashgar).